Japanese Chins are small, dainty dogs whose behavior is often catlike. 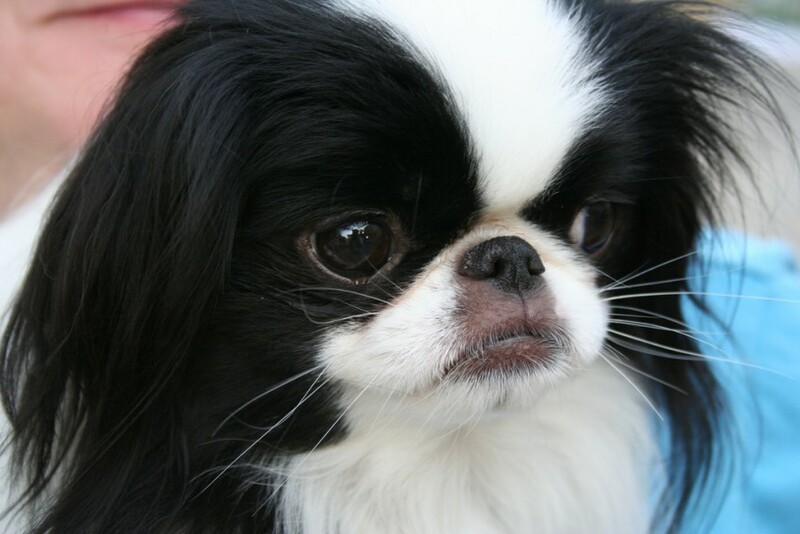 The Japanese Chin is a small, dainty dog with a flat face. The breed was previously known as the Japanese Spaniel. Their protruding eyes are set far apart and are dark with white inner corners. Their small, v-shaped ears are feathered with hair, and their nose is very short. The feet resemble those of a hare and are feathered. The high-set tail is plumed and carried over the back, and it generally rests on one side of the body. The semi-long, smooth and silky coat comes in colors of black and white, black, tan and white, lemon and white, red and white, sable and white, white and black, and may have red markings. Japanese Chins were native to China and used to warm the laps of Chinese nobles. They were given to Japan as a gift, and Japanese nobility coveted the dogs. Depictions of the breed date back centuries. They can be found on ancient tapestries and pottery. The first Japanese Chins to arrive in England were a pair of dogs gifted to Queen Victoria in 1853. During World War I, it was difficult to sustain the breed because imports from Japan were suspended. Dogs were eventually brought over from Europe to start the American breeding program. The American Kennel Club recognized the breed in 1888. Alert, playful and affectionate, Japanese Chins can also be stubborn and headstrong. 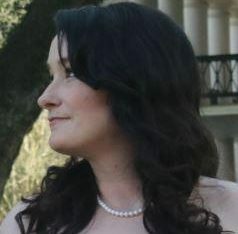 They are devoted to their family members but may be wary around strangers. They are good with other animals and although they make good watchdogs, they are not known to bark often. They have cat-like characteristics, such as self-grooming and a desire to be up high (climbing to the back of a sofa is a common favorite spot). LOW: This breed is great for apartments because of the small size of the dogs. A daily walk is all that’s needed for exercise since they are active indoors. They should be socialized, especially because of their wariness of strangers. They can be obedience trained and perform tricks, but their stubborn nature often leads to the human being trained — not the dog. MEDIUM: Japanese Chins shed an average amount, and they should be brushed twice per week. Bathing can be done as needed. Their strong, quick-growing nails should be trimmed often, and their protruding eyes should be cleaned as often as necessary. Check the ears for wax and debris, which can lead to infection. Brush the teeth regularly to remove tartar buildup. MEDIUM: Japanese Chins are a brachycephalic dog breed, so there are some health issues to be aware of in regards to their flat faces (as well as their small bodies). Keep them protected from high heat, and pay attention to their breathing for changes. They typically wheeze and snore, but increased or highly repetitive wheezing may require the attention of a veterinarian. 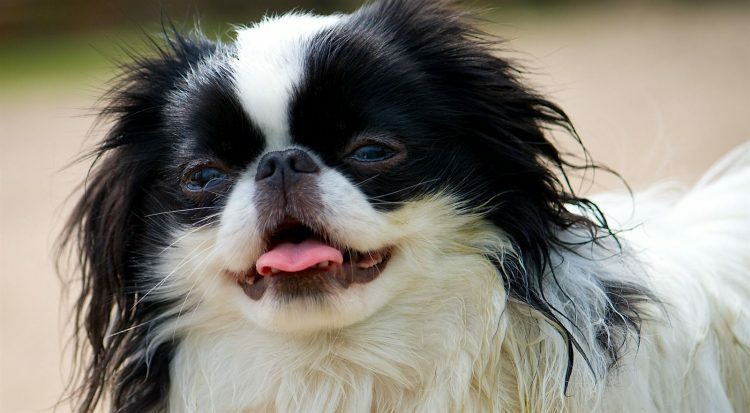 Check with shelters and rescues first when looking for a Japanese Chin. If you choose to contact a breeder, insist on inspecting the breeder’s facility and seeing the dog’s parents. Additionally, because the breed is prone to luxating patellas and eye issues, ask for health clearances from the breeder. Any responsible breeder will test their dogs and report the results to this database, even if the results are unfavorable (tests are available for the knees, heart and eyes). Japanese Chin Club of America, Inc.